You may have noticed that DOCTOR WHO hasn’t been in the schedule these past few weeks. In order to understand why, you’ll have to understand more about the wibbly-wobbly world of television programming. It’s bigger on the inside. All of time and space, everywhere and anywhere, every star that ever was…Where do you want to start? How about 2014? We purchased the broadcast rights of DOCTOR WHO Series 8 from our BBC programming distributor back in 2014. 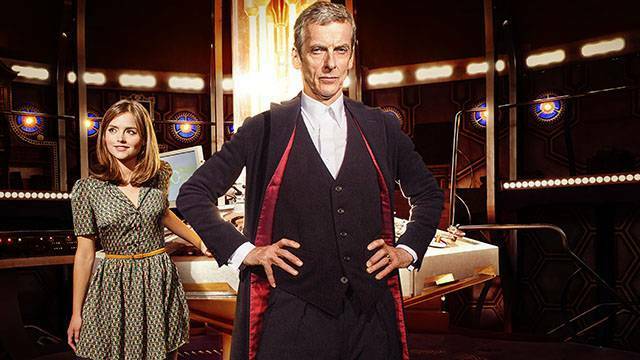 Because of an unfortunate and unforseen arrangement between the distributor and BBC America (yes, the cable channel), we weren’t allowed to air Series 8 until September 2015. The distributor graciously granted us extra releases of Series 6 and 7 while we waited for Series 8. For almost a year, we were the epitome of Amelia Pond, the girl who waited, sitting on our luggage and waiting for the new series to begin. Finally, the Series 8 rights window opened and… Geronimo! Fast forward to now. We’ve been airing Series 8 since September 2015. We’ve already used two of our three releases, and now we’re stuck with a conundrum. We could use up our final release of Series 8 and appease Whovians for 13 more weeks, or we could wait and air the final release right before Series 9 begins. As the Doctor once said, "Sometimes the only choices you have are bad ones, but you still have to choose." If you’re a DOCTOR WHO fan -- and you probably are or you wouldn’t have read this far -- then you know Series 8 begins, more or less, with a regeneration. It’s the beginning of the Twelfth Doctor’s story and it’s a great place to start DOCTOR WHO on OETA again after a hiatus. Otherwise we’d be starting Series 9 out of nowhere, thus confusing potential new Whovians. So, that's the decision we've made. We’re holding the final broadcast of the Series 8 episodes until we have a known airdate for the premiere of Series 9. Now you’re going to want to know when we'll start Series 9. Unfortunately, we don't have this information yet. We’d need a timey-wimey detector for that. (It would ding when there’s stuff.) I’ve been doing this job for about 16 years and so I can give some pretty educated spoilers...I mean guesses. My guess is that we’ll find out more information in the fall, and we’ll likely get Series 9 in the spring or summer of 2017. But I'm an optimist. A hoper of far-flung hopes. A dreamer of improbable dreams. I know that's at least a year away. I hate waiting as much as you. I, too, want my idiot with a box and a screwdriver. Let's just sit tight, stay calm, and don't be lasagna.